Studying at the Murazzi at night? From November you can. Home/News/Studying at the Murazzi at night? From November you can. More spaces where to study at night: more and more students feel this need. 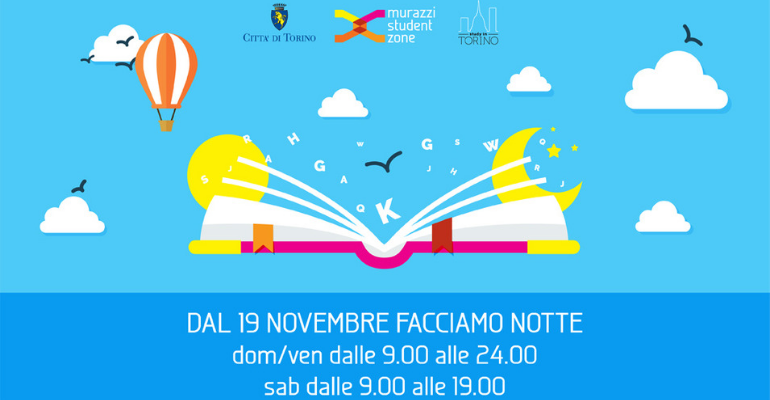 In order to meet this need, 270 places of the Murazzi Student Zone will be available for night study for all students, from 7.00 to 12.00 pm, in addition to the traditional 9am-7pm opening hours. The new opening hours from 9am to 12pm, which will start from Monday 19th November 2018, will be from Monday to Sunday. On Saturday it will remain 9am-7pm. “For the city, this is an important investment, which has to be added to the one of last year, aimed to grant more resources at the revolving found Edisu for residences of students”, said the councillor for Politiche Giovanili and Città Universitaria Marco Alessandro Giusta. “For the municipality the support of students is part of a big action plan on youth policies, which wants to make young people the protagonists of the cultural and political life of our city. This is an investment on knowledge and culture, which is the only real opportunity of growth in the 3rd millennium”. It was the end of November of 2 years ago. During the Autumn of 2016, a flood submerged the spaces of the Murazzi Student Zone, the study room opened in May 2013 in a symbolic place of the city and which became, from then on, a reference point for the students of Turin. Two years later the new Murazzi Student Zone, which has been restored and newly reopened, tries new opening hours, in order to welcome the increasing demand of places destined to study (since exams of the Politecnico and of the Università di Torino are drawing near). Follow the Student on Facebook!